Believe it or not, I get asked this question at least 3-4 times per month: “How can I enable Gmail templates so I don’t have to type out the same email all the time.” This is a feature that I’ve been using for at least 5 years and take advantage of on a daily basis. The thing I love about templates is you don’t have to use the exact wording each time, you can modify it a little bit each email and change things around. 1. 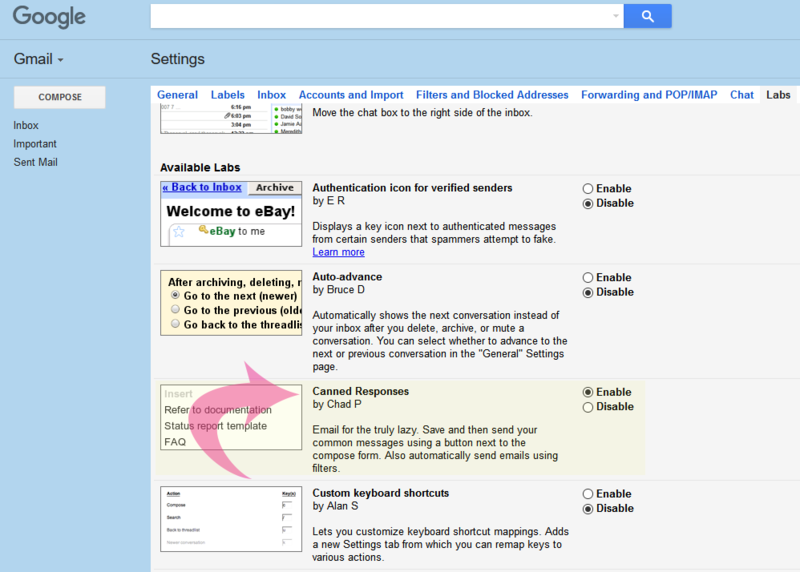 To kick things off, crack open Gmail.com in your web browser (this should also work for Google Apps). 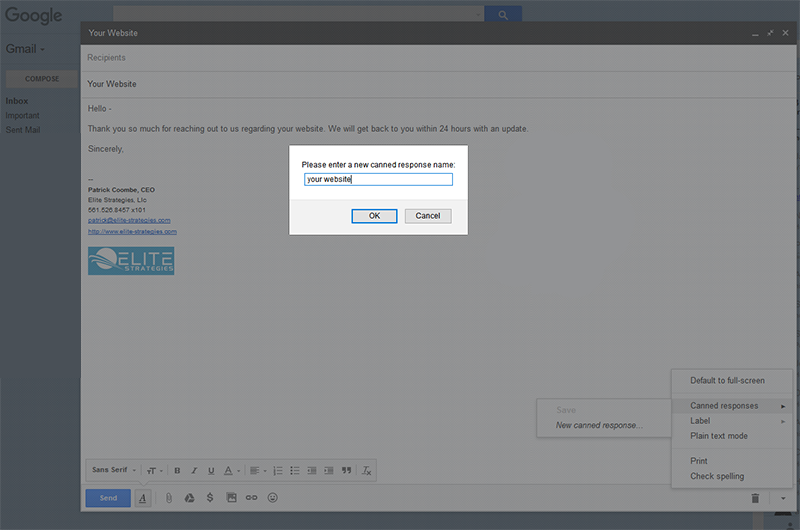 Go to settings > Labs and enable “canned responses.” Save changes and head back to your inbox. 2. Select “compose” to start a new email. 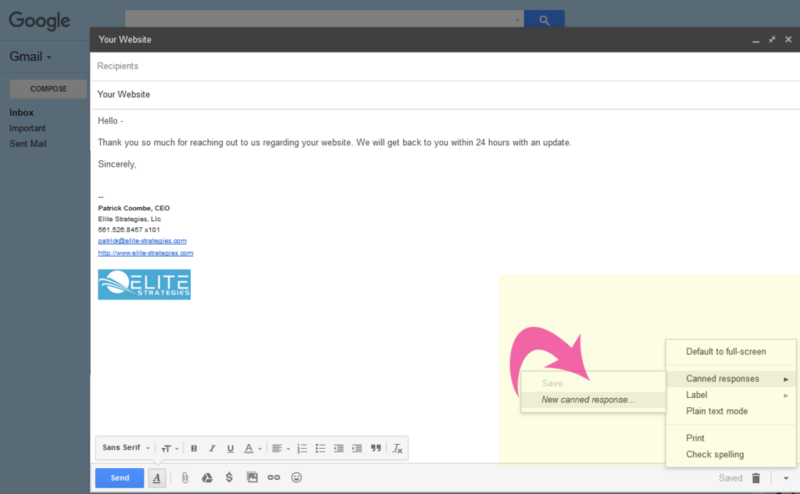 Type out a subject line and create some text in the body of your message. You can always change this later. This will be your first canned response / email template. 4. Close the email, then open a new one. Go back down to the arrow at the bottom right hand side and select “canned responses” and you should see the email that you saved. take note that if you save the canned response under one email, it will change the “from” address to what you saved it as, make sense. Another note, spawning from the first note: if you reply with a canned responsive (rather than composing a new message) it will change the “from” address when you reply. Normally this isn’t a big issue but if you are at a company and only email from your @example.com domain and reply with your @gmail.com some consider this unprofessional. This is a huge topic of debate in our office. 3rd party add-ons can really be a nuisance. While I truly live and die by a few addons (Wappalyzer, ABP, etc) having too many add-ons can really eat away at your memory and overall resource usage on your computer. Add-Ons are also notorious for stealing your data, especially when it comes to email. I don’t want anyone seeing who / what I am emailing or stealing “my list.” I realize the government and Google are already doing this, but there is no reason to bring even more parties into the mix.